L’Enfant Sauvage, directly translated as The Wild Child, is the fifth studio album from French metal band Gojira. It was released in the summer of 2012 on Roadrunner Records. Gojira’s previous release, The Way of All Flesh, was released in 2008 so there had been a long wait for this album but was it worth the wait? There are 10 tracks in total although one of those 10 is an almost 2 minute long musical interlude. The alum kicks off with the longest track on the album. Explosia, at just under 6mins and 40 secs, hits home with typical unpredictable rhythm, heavy and melodic riffs to die for and wonderfully raspy lyrics spat and sang at you. It doesn’t take much of the first track for you to realise that this album could be something special. 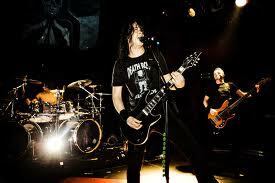 Explosia is followed by the title track which, after a few seconds of a slow intro, explodes into a mixture of thrash and intricate rhythm again backed up superbly by Joe Duplantier’s fantastic vocals. The next two tracks, The Axe and Liquid Fire, absolutely ooze intensity and class and are, in my opinion, two of the best tracks ever played by Gojira. The drumming is hectic, the guitars lay rhythm down on top of that and the vocals fit perfectly. These tracks are followed by a perfectly placed 2 minute long musical interlude which will give you just enough time to realise how wonderful those first 4 tracks were before track 6, Planned Obsolescence, raises the tempo dramatically as does the next track, Mouth of Kala, while maintaining the technical ability the band are so loved for. The Gift of Guilt, is my personal favourite track on the album and uses a building guitar riff as intro and then switches to it for each chorus with verses that are heavy as anything done by them before. Pain is a Master starts very slowly with around a minute of soft chords and gentle drumming before kicking in spectacularly for a few minutes before returning to the bass, softer style of the intro to end with. This leads to the final track, Born in Winter, which again starts with a very slow tempo and almost spoken word vocals before going straight into a heavier and louder chorus and middle section before playing out at the same slow rhythm to end the album. That is my only complaint really as an album this good deserved to end with a roar rather than a whimper, despite the quality of the final song, the last 60 secs of the album are far removed from the rhythmic aggression of the rest of the album. Gojira, in my opinion, have released their best work to date with typically philosophical lyrics and technically admirable musicianship merging together to give us one of the finest albums of the year. My only complaint is that I feel the last track would have been better swapped with something like The Gift of Guilt so that the album ended with more force but that is a minor issue and is easy to ignore when compared to the pure quality of the rest of this album.